Customers will check you out online. They will Google your company name. Will they see Good things…or Bad things? Google your business name right now! See what shows up. Managing and monitoring your online reputation is important. You need to pay attention to what the market is saying or not saying about you. You need to monitor reviews that may be published about your business so you know what others are saying about you. Like a restaurant that serves bad food, people tell others and then never go to that restaurant. However, if they serve great food, word spreads and the business grows! You must know what people think of you so watching your online reputation is important! RCM helps roofing contractors manage their online reputation. Roofing contractors are especially vulnerable to consumers who are more paranoid than usual about which company they choose. Roofers have a bad rap in general so it is important to keep your rap sheet clean!! Do you have any Rip Off Report notices associated with your company? Many roofing companies do – and many are NOT LEGIT! 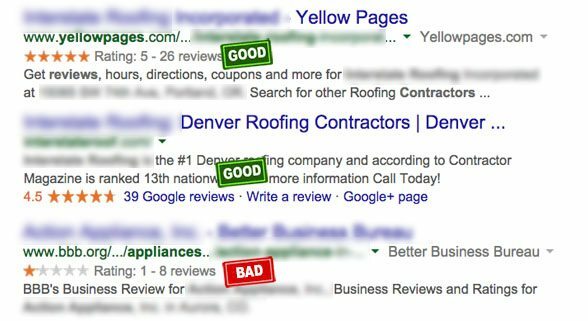 It is a brutal reality, but in the competitive roofing industry some bad characters will write bad reviews about competitors just to be evil. It should be illegal in our opinion but there is not much currently businesses can do about it.